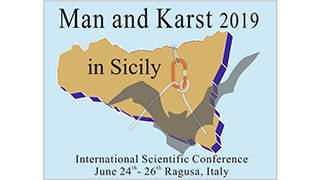 The international scientific meeting "Man and Karst" will be held in Sicily from 24th to 26th June 2019. The extreme south-eastern sector of Sicily, which geographically belongs to the Hyblean Mountains, but geologically to the African foreland, represents an outstanding example for the comprehensive understanding of karst. Here we will explore pure karst landscapes, deeply carved by spectacular and evocative canyons and their profound relationship with Man. In this karst stage, at the center of the Mediterranean, dominated by the fire of Etna volcano to the north, lapped by the arid landscapes of the Messinian evaporitic salts to the west, the millenary history of Siculi people unravels: ancient inhabitants of the summit of the limestone plateau, today from the heights of overhanging cliffs, silent guardians of the still luxuriant karst waters, emerging from numerous cave-springs, flowing along suggestive verdant valleys of fragrant Mediterranean scrub. In this context, the common relationship of Mediterranean peoples with its own peculiar karst environment has been represented for centuries, in the past with a wisely and naturally sustainable use of its resources, nowadays in an increasingly conflictual way, as dramatically devastating of its precious resources, first of all the karst waters threatened by heavy degradation for a senseless and inconsiderate use of the territory. For all this, Man and Karst 2019 in Sicily, in the same way as the previous past editions, wants to give a contribution to the knowledge, enhancement and safeguard of the karst landscape with its ecosystem and historical-anthropological resources as a whole, as an instrument and optimal function of scientific research, not as often for its own sake or for the sake of a few users, but rather, at the service and for the benefit of the whole community. The event will be held from 24th to 26th June 2019 in the fascinating location of the Donnafugata Castle, a sumptuous noble residence of the late '800 a few kilometers from Ragusa, Sicily.